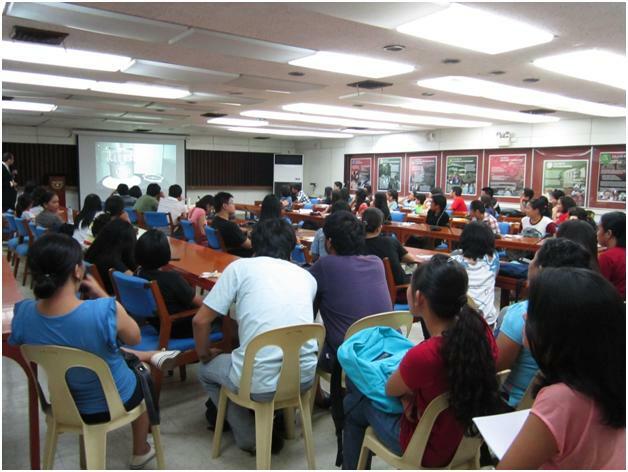 Students (mostly applied physics and MST) fill the AG samonte Hall during the lecture of Dr. Lutz Linhorst. Here the students watch a video presentation about decommissioning. Nowadays, energy is the new gold and many believe that the most practical source of this gold is a nuclear power plant. Many developed and developing countries are trying really hard to put up nuclear power plants that would generate energy and supply electricity for their country. However, the use of nuclear power as a source of energy is a controversial issue. It is not expensive (considering the return that the operators would get from it). Also, it does not contribute to air pollution. But the downside of nuclear power is observed during accidents at nuclear power plants. Released radioactive substances could cause deaths and environmental disaster. The major concern now is to ensure nuclear safety and radiation protection. Thus several researches were done or are being done to improve radiation protection and nuclear safety. 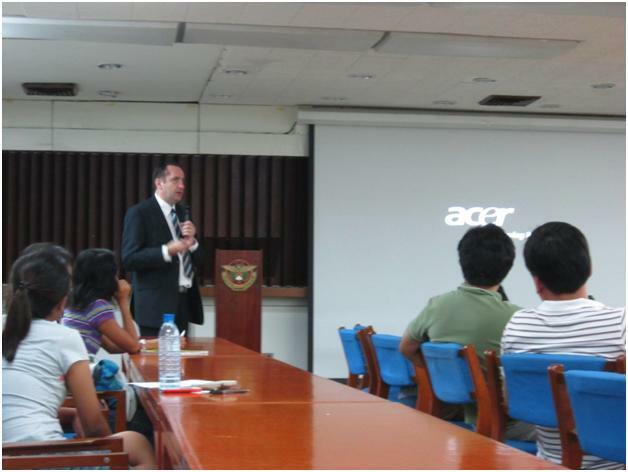 Dr. Lutz Linhorst, a senior coordinator in the Human Environment and Transport Inspectorate of the Ministry of Infrastructure and the Environment of The Netherlands, delivered a special physics lecture about underwater technology in the repair and decommissioning of nuclear facilities at the Operations Room, AG Samonte Hall, UPLB, last July 6. 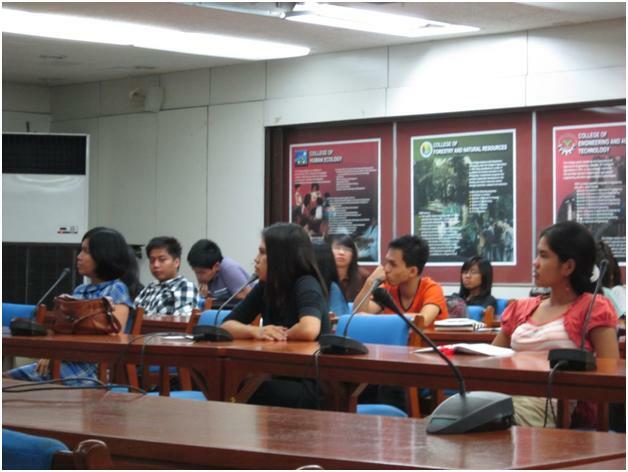 UPLB students and teachers, mostly from the Physics Division, attended the lecture. Dr. Linhorst answers a question about the economic or financial concern that decommissioning or the use of underwater technology would pose to the operators. The lecture’s topic is timely and interesting since it is related with the issues about nuclear power plants that is a worldwide interest. Dr. Linhorst first discussed the basics of radiation protection. Then he explained how water is used in nuclear facilities for radiation protection purposes. He identified the main application of underwater technology like in-service inspection, minor repair works, and decommissioning. He said that it could be a good turn out to the operation if underwater technology is used for the Fukushima clean up. Students listen as Dr. Linhorst answers the question about how water would be treated after the decommissioning. Major nuclear power accidents in the history like the 3 Mile Island 2 (TMI2) accident in USA and the very recent Fukushima disaster were discussed during the lecture. Dr. Linhorst explained how the accidents happened and gave possible solutions to the problems posed by the accidents. He also presented several video presentations to show how underwater technology is used for the repair and decommissioning of nuclear facilities. Teachers and students threw many questions to Dr. Linhorst during the open forum. One teacher asked about the economic or financial concern that decommissioning or the use of underwater technology would pose to the operators. Another asked about the reliability of the machines since they are subjected to water and radiation. Dr. Linhorst said that radiation is not a major problem to the machines. He added that researches are now being done concerning the types and designs of nuclear reactors so that they will be easier to decommission. When an Applied Physics student asked about what they will do to the water after the decommissioning, Dr. Linhorst said that nuclear power plants do not need another facility to clean the water. Extra facilities for the water treatment, he said, will only be needed in case of emergency. A teacher from the Physics Division asks if the Bataan Nuclear Power Plant could be used or converted into an educational park. Dr. Linhorst said that the society as a whole should be prepared about the operation of a nuclear power plant.The operation of the Bataan Nuclear Power Plant is also a controversial issue here in the Philippines. Many oppose the power plant’s operation, because of the danger that it would pose to the public. On the other hand, other Filipinos want it to be operational so that it could solve power shortages in the country. The use of underwater technology and other technology for the repair and decommissioning of nuclear facilities is not just a scientific or technological issue. It is also an economic, political and societal concern. The bad thing is that the leaders of various countries do not focus more on the science of things. “The politicians did not understand the physics in here,” Dr. Linhorst said. “Not all politicians are physicists,” he added. The special physics lecture would be an annual event. 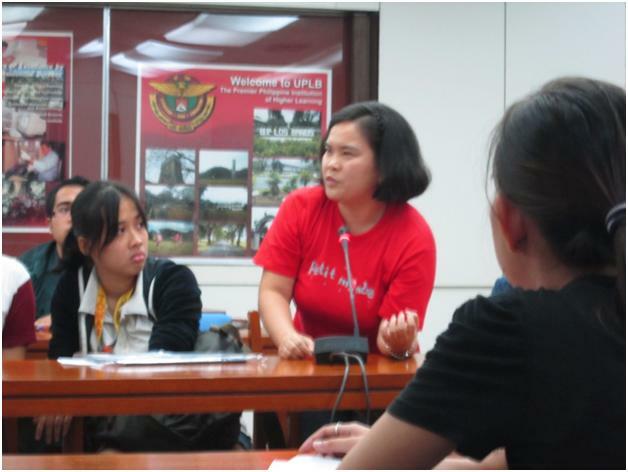 Moreover, the Physics Division of UPLB would continue inviting distinguished speakers for applied physics majors. This entry was posted in Science and tagged Bataan Nuclear Power Plant, decommissioning, DEVC122, nuclear energy, nuclear facilities, nuclear power plants, underwater technology. You took good notes especially during the open forum 🙂 Good. This is a message to the admin. I discovered your “https://geezee001.wordpress.com/2012/07/12/underwater-technology-for-radiation-protection/” page via Google but it was hard to find as you were not on the first page of search results. This means you are missing out on a ton of website traffic from Google. I have found a website which offers to dramatically increase your rankings and traffic to your site: http://venueseo.com/7-day-free-trial. I managed to get close to 1000 visitors/day using their services, you could also get lot more targeted traffic from Google than you have now. Hope this helps 🙂 Take care.